Timor-Leste, generally known in English as East Timor, is a former Portuguese colony on Timor, the southeasternmost major island of the Indonesian archipelago. Colonized in the 16th century, Timor Leste was a remnant of the once-extensive Portuguese holdings in the Indies. Indonesian troops seized the country when Portugal withdrew in 1975. This led to a long struggle for independence, which was finally achieved in 2002. Timor-Leste has a population of more than 1.1 million. Dili, located on the north coast, is the capital and the only major port. Aids to navigation in Timor-Leste are operated by the Port of Dili, an agency of the Ministry of Transport and Communication. The Portuguese word for a lighthouse is farol, plural faróis. ARLHS numbers are from the ARLHS World List of Lights. Admiralty numbers are from volume Q of the Admiralty List of Lights & Fog Signals. U.S. NGA List numbers are from Publication 112. Coming soon: photo by various photographers posted by Alexander Trabas. Date unknown. Active; focal plane 31 m (102 ft); white flash every 4 s. 27 m (89 ft) square skeletal tower with gallery, painted white. Aires Sarmento has a photo, Adi Dethan also has a photo, Wikimedia has a closeup by Regio Da Cruz Salu, and Google has a satellite view. Oecusse (or Oecussi) is an exclave of Timor-Leste on the north coast of Indonesian West Timor, separated from the rest of Timor Leste by about 70 km (44 mi) of Indonesian territory. The light predates the development of the modern port, which began with Japanese aid funding in 2011. Located at a port facility near Pante Makassar in the eastern part of the exclave. Site open, tower closed. Admiralty Q1365.7; NGA 25702. 1896. Active; focal plane 19 m (62 ft); white flash every 6 s. 17 m (56 ft) octagonal skeletal tower with lantern and gallery, rising from a massive masonry base that presumably included the keeper's quarters. Access to the lantern is by an exposed stairway that spirals around a central column. 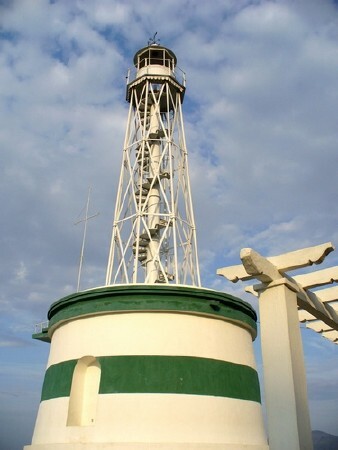 Lighthouse painted white with two green horizontal bands around the base. Kok Leng Yeo's photo is at right, Wikimedia has David Stanley's 2011 photo, Albert Maramis has a 2009 photo, and Google has a good satellite view. A 2004 photo of this unusual lighthouse shows it painted all white. Located on the beach on the western side of Dili, the capital of Timor Leste, not far from the U.S. embassy. Site open, tower closed. ARLHS TIM-001; Admiralty Q1368; NGA 25708. Date unknown. Active; focal plane 12 m (39 ft); green flash every 5 s. 12 m (39 ft) round vase-shaped fiberglass tower colored green, mounted on a platform supported by piles. Takahashi Masaki has a photo showing the historic lighthouse on the right and the entrance beacons on the left, and Google has a satellite view. Located on the west side of the entrance channel. Accessible only by boat. Site open, tower closed. Admiralty Q1368.3; NGA 25709.5. Date unknown. Active; focal plane 12 m (39 ft); red flash every 4 s. 12 m (39 ft) round vase-shaped fiberglass tower colored red, mounted on a platform supported by piles. Takahashi Masaki has a photo showing the historic lighthouse on the right and the entrance beacons on the left, and Google has a satellite view. Located on the west side of the entrance channel. Accessible only by boat. Site open, tower closed. Admiralty Q1368.2; NGA 25709. Date unknown. Active; focal plane about 15 m (49 ft); red flash every 4 s. Approx. 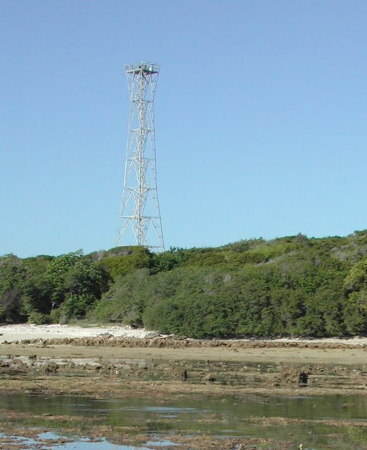 15 m (49 ft) square skeletal tower carrying a red triangular daymark, point up. Ocha Maosawati has a photo, Dedi Suherman has a street view, and Google has an indistinct satellite view. The rear light is apparently mounted on one of the government buildings. Located in front of the Palácio do Governo on the Dili waterfront. Site open, tower closed. Admiralty Q1369; NGA 25708.5. Date unknown. Active; focal plane 11 m (36 ft); white light, 1 s on, 1 s off. 11 m (36 ft) square skeletal tower painted white. No photo available, but Google has a satellite view. Com is a small beach resort near the northeastern tip of Timor. Located just off the beach in the harbor. Site open, tower closed. Admiralty Q1371; NGA 25717. Date unknown. Active; focal plane 35 m (115 ft); three white flashes every 9 s. Approx. 11 m (36 ft) square skeletal tower painted white. No photo available, but Google has a satellite view. Com is a small beach resort near the northeastern tip of Timor. Located on a steep hillside south of the harbor. Site open, tower closed. Admiralty Q1371.1; NGA 25717.1. Date unknown. Inactive since 2010. Approx. 35 m (115 ft) square skeletal tower, painted white. Keeper's houses in ruins. Colin Trainor's photo is at right, and Google has a satellite view of the station. Located on a small island off the eastern tip of Timor. Accessible only by boat. Site status unknown. ARLHS TIM-002; ex-Admiralty Q1371.5; ex-NGA 25717.5. 1904. Inactive for many years. Approx. 10 m (33 ft) round stone (or concrete) lighthouse. Wikimedia has a photo by Hans-Peter Grumpe. Iliomar is on the southeast coast of Timor-Leste. The Portuguese built a small fort here in 1904, but the buildings are all in ruins today. Exact location not known; more information is needed. Posted April 13, 2006. Checked and revised May 10, 2018. Lighthouses: 9. Site copyright 2018 Russ Rowlett and the University of North Carolina at Chapel Hill.